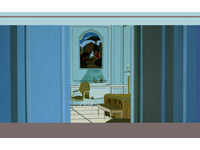 Stasis depicts the final scenes from Stanley Kubrick's 2001: A Space Odyssey (1968), a film that portrays the experiential shift that takes place with technological determinism, especially in its production of an accelerated speed by which we engage the world. 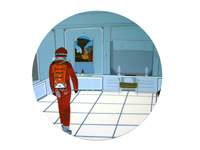 This series of paintings focuses on the state of stasis the astronaut finds himself in after being tested beyond his sensory and cognitive limits. 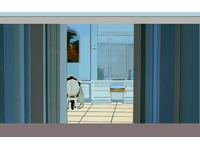 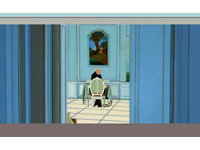 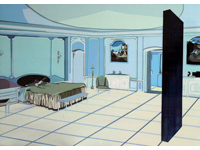 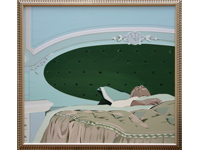 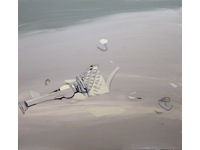 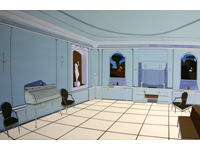 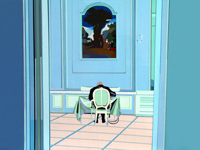 The final scenes of 2001 portray the astronaut held in a kind of eternal recurrence inside an interior that collapses the styles of various eras with its futuristic floor-lit tiles, Louis XVI furniture, and 18th century Rococo-like paintings, which in concert express a strange sense of pristine equilibrium. 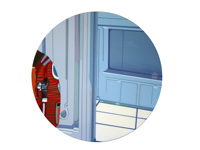 While positioning humankind as the ultimate figure of stasis in the constant trafficking of energy and information, these scenes also reveal the cost of attaining this triumph in the struggle of survival against our technological innovations and the seemingly benign forms of progress. 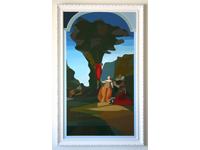 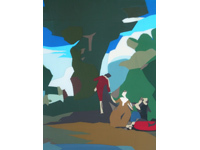 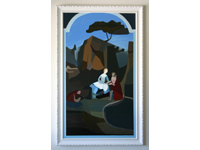 The scenes are reconstructed in stenciled acrylic paint on surfaces of Acrylite and expanded PVC with applications of clear medium separating the layers of paint. 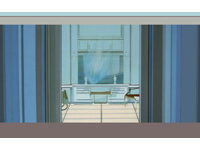 Due to this mechanical process, the overall effect mimics the aesthetic of screen graphics from afar, but as the viewer approaches the work, the flat image breaks into multiple layers where components in the foreground loom closer to the surface.